* Is Formulating A Marketing Strategy for Your Business Taking Up All Your Time? * Are You Unable To Connect With Your Customers? * Would You Like to Reach Out to More than a Million People with the Click of a Mouse? * Are You Struggling With Social Media Marketing? Fortunately, Social Media Marketing when used effectively can drive more traffic, increase more sales, and target more leads to your business than any other traditional methods. *	93 of all business buyers are social media advocates. *	81 of B2B companies have accounts on social media sites. *	77 of B2C and 43 of B2B companies have acquired customers from Facebook alone. *	Executives from all Fortune 500 companies use LinkedIn. LinkedIn is responsible for bringing in over 12 million visitors a day! *	There are over 600 million users on Twitter daily and 33 of marketers have generated leads by using Twitter alone. *	69 of online consumers who use Pinterest have found an item they have bought or wanted to buy, while the monthly unique visitors have increased from 10 million to over 2702 since 2011. *	40 of marketers use Google Plus and Google Hangouts to generate sales and leads. Google Plus now has over 500 million users and counting! *	MySpace is now generating more than 50 billion page views monthly from potential consumers worldwide! *	In 2012 annual social commerce sales were at 9 billion but are expected to climb to over $30 billion by 2015! 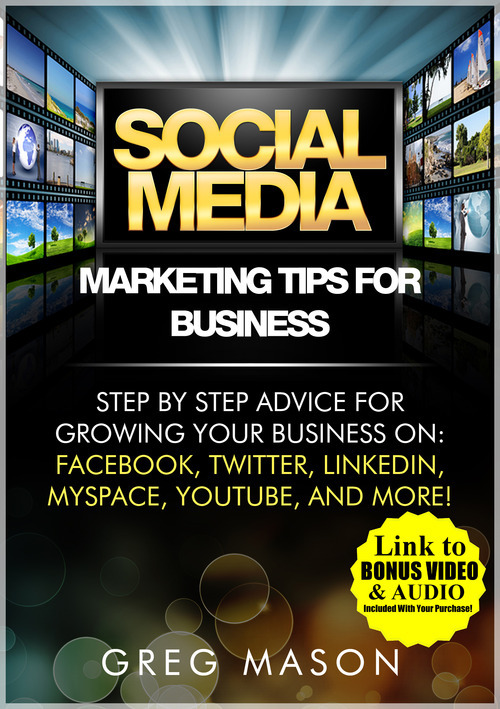 Social Media Marketing Tips for Business features all the advice you need to immediately start driving powerfully relevant traffic, more leads, and sales to your business or brand. We have included for you Hours of Time-Tested HD Videos, Audio Tutorials, and Guides that professionals have used for Years to Grow Their Businesses Worldwide! Since the world of social media marketing is forever growing and changing with new strategies and tweaks to social networks; Social Media Marketing for Business is REVISED REGULARLY FOR YOU, with FREE UPDATES FOR LIFE! ....GRAB YOUR COPY TODAY! * Social Traffic Profits - Increase Your Access to Highly Targeted Leads with This Step-by-Step Video Guide and Discover How To Quickly and Easily Build High Converting Leads For Your Niche By Using MySpace, Linkedin, Yahoo Answers, Facebook, StumbleUpon, and More! * YouTube Marketing Secrets - A Collection of 22 Professionally Recorded (HD VIDEOS) If You Follow These Simple Steps and Start Experimenting with Video marketing & YouTube. You will have an unlimited supply of traffic at your fingertips, just waiting to be converted into sales. * Twitter Mastery in 40 Hours or Less - "Cash In With Twitter and Get Real-Time Access To Your Market" Watch 21 (HD SCREENCAST VIDEOS) Recorded 'Live' Using a New Twitter Account. * Facebook Rockstar System - The Step By Step Method Of Building Massive Targeted Facebook Profits This step by step (VIDEO SERIES) will take you from Facebook For Fun To Facebook For Profit. This powerful coaching holds many keys to unlocking the facebook goldmine. In The Big Bucks Using Google Adwords!